Stan Kowalski (born Bert Smith; May 13, 1926 – October 20, 2017) was an American professional wrestler. He was one half of the tag team Murder Incorporated with partner Tiny Mills in the American Wrestling Association (AWA) from 1960 to 1975. Kowalski wrestled and played football at North High School. Afterward, at age 17, he joined the U.S. Navy and served on a Pacific submarine for three and a half years during the Second World War. He enrolled at the University of Minnesota after the war. He joined the wrestling team, where he met local promoter Joe Pazendak, the Universitys unofficial assistant wrestling coach. He turned down a chance to play football for the Green Bay Packers in 1950. 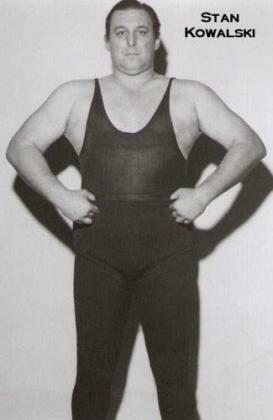 Kowalski turned to professional wrestling, debuting as Buddy Marco for a NWA promotion run by Tony Stecher. He traveled to Los Angeles, where he trained with Sandor Szab In 1955, promoter Jack Pfefer changed his ring name to Krusher Kowalski; Kowalski was a family name. He later formed a tag team with Canadian wrestler Tiny Mills as Murder Incorporated. They wrestled together in Canada, Japan, Australia, New Zealand, and the United States. They won the Minneapolis version of the NWA World Tag Team Championships twice while working for the NWA Minneapolis Wrestling and Boxing Club. When that promotion became the American Wrestling Association (AWA) in 1960, Mills and Kowalski became the first AWA World Tag Team Champions. They also won the Canadian Open Tag Team Championship, defeating Billy "Whipper" Watson and Ilio DiPaolo in 1960. They lost the championship early in 1961. Later, he managed Ivan Koloff. In 1969, he has a brief appearance in an Ohio promotion, Ohio Wrestling Classics. Then, in 1970, he went to New York to wrestle in the World Wide Wrestling Federation (WWWF) as Krippler Karl Kovacs. In Pennsylvania, Kowalski and Bruno Sammartino set a record attendance and gate of $86,000. After retiring from professional wrestling, Kowalski owned a night club with wrestler Blackjack Daniels, worked as a police officer, union negotiator, and business agent. He resided in Minneapolis, Minnesota, where he was active in charities, fundraisers, and speaking engagements. He volunteered with the United Way and helped homeless veterans. Kowalski was married to his wife Cleo since 1961 and had two children, a son Scott Smith, and daughter Stacy Smith. He lost part of his colon due to cancer in 2006. He died on October 20, 2017. Kowalski received a Lifetime Achievement Award from the Improved Order of Red Men in 2016. In addition, the Veterans of Foreign Wars presents an award named in his honor.